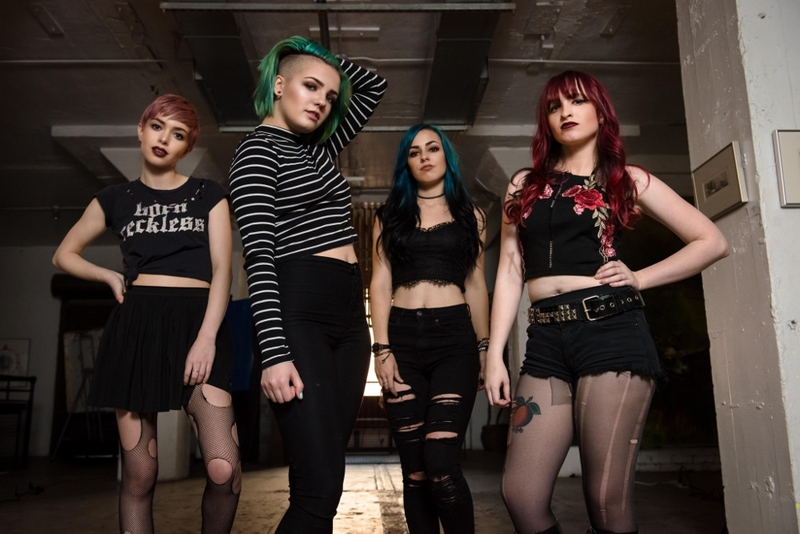 Doll Skin is an all-female rock band consisting of Sydney Dolezal (vocals / guitar), Alex Snowden (guitar), Nicole Rich (bass) and Meghan Herring (drums), and are based out of Phoenix, AZ. Their musical sound is a blend of hard rock, punk rock, pop and alternative. The band has been compared to the likes of The Donnas, The Runaways and the Go-Go’s. Doll Skin initially formed in 2013 with the intention of competing in the Rock Revolution battle of the bands, which featured bands who were local to the Scottsdale, AZ area. One of the judges of the event happened to be David Ellifson, bassist of the thrash metal band, Megadeth. After winning the battle of the bands, the band would then be managed by Ellifson who would also produce their material. In 2015, Doll Skin released their debut EP, In Your Face. The band re-released the EP as a full length and titled it In Your Face (Again) which included additional tracks that were not included on the initial EP release. In 2017, Doll Skin released their first full length album, Manic Pixie Dream Girl. The band has been consistently touring for the past couple of years. Their latest stop to the Emerald City was the fourth time that Doll Skin performed in Seattle in less than two years (twice with Otep in 2016 during Otep’s “Generation Doom” tour in February and again during Otep’s “Equal Rights / Equals Lefts” tour in June, both held at Studio Seven; opening day of the Van’s Warped Tour at the CenturyLink Field’s North Lot this past June 2017; and again at Chop Suey on August 17th). SMI’s Mike Baltierra sat down and had a quick discussion with Meghan Herring, Alex Snowden and Nicole Rich prior to the show at Chop Suey. SMI: You are managed by David Ellifson of the band Megadeth. How did that come about? Herring: I had heard that there was going to be a battle of the bands thing going on at the high school I attended. I got the girls together – we had met at School Rock – and we practiced a few times and we entered the contest and we won. We had been told there would be celebrity judge for the contest – and we didn’t think much of it, until we found out that it was David from Megadeth. Turns out his son attended our high school, which led to David being asked to be a judge for the contest. SMI: What does the band have planned once this leg of the tour ends at the end of August? Herring: Once we are done with this run of the tour in a few weeks, we are heading out again, this time supporting One Eyed Dolls. We have been touring a lot this year…A LOT. But it’s what you’re supposed to do when you’re a baby band. Go, go, and go – all the time. Snowden: After the tour with One Eyed Doll, we have about six weeks off before we head out to Ship Rock, which we had previously played on back in 2016, so we are really excited to be back in 2018. Hopefully we can look forward to playing some shows outside of the United States. We have a show coming up in Mexico – last year we had played a show outside of a festival called Circus Mexicus – we were invited to come down and play a house show and a ton of people showed up and it was very cool and we are looking forward to doing that again. Herring: Also, we are constantly writing – there is no break in writing new material. Snowden: We have been really good about writing while on the road this time around. We haven’t done that in the past, so we will be better prepared the next time we enter the studio. SMI: What are some of your favorite areas or cities to visit or play in? Rich: The reason why we keep coming back to the Pacific Northwest is because Seattle and Portland are easily in the top five cities in which we love to visit and to play in. Snowden: California is pretty cool. The venues are pretty neat and the venues are in pretty scenic areas. West Coast is very cool, although we do have a lot of fun on the East Coast. It’s really interesting the see the differences in venues and crowds. SMI: How do you feel when others have compared Doll Skin to such bands as the Runaways, the Donnas or the Go-Go’s? Snowden: It’s so cool. The Runaways are so cool. We love to watch the Runaways movie! Herring: They are cooler than us LOL! Rich: It’s very cool. That’s the kind of energy we are going for. Snowden: Interestingly, we have never listed the Donnas or the Runaways as inspirations or influences. But we are very into Bikini Kill, Foo Fighters, Paramore, Green Day, NOFX, Avenged Sevenfold, Antiflag, Beartooth, Danzig, Tool – they are bands we love to listen to. But what we listen to or get inspired by is constantly changing or evolving. SMI: Any acts that you would like to tour with? Snowden: Paramore! Creeper….any band that has ever been on the Warped Tour, including any of the deathcore or metalcore bands! We would do it! SMI: If not for playing music and touring, what do you foresee yourself doing? Snowden: I would be going to school, and I would be getting really good grades. I mean, I have good grades but I am behind right now. I would also like to think that I would be involved with music is some sort of fashion, say as an engineer. Engineering requires some schooling, but that has been pushed back because of the constant touring. Outside of that, I honestly have no idea. Rich: I would be in college full time, as in away at a full time university. Also, I have no idea what else I would be doing other than studying. Since we are touring, I can do classes online and I can go at steady pace. I would also be more artistic and do more drawings. Herring: I feel that I would also be away at a university, most likely studying photography, which would eventually lead into music. Since I am obsessed with concert photography, I would be constantly going to shows and capturing images. I do honestly believe that we, the four of us, are supposed to be a part of this band. SMI: Going from larger audiences that you played in front of at the Warped Tour to playing smaller venues, do you treat each so the same? Snowden: We treat each so the same – we go out there and have as much fun as we can. Everything is different and there is no need to compare things like that. Herring: We just love to play shows. Any show is a good show. We treat it as if we are playing a stadium.